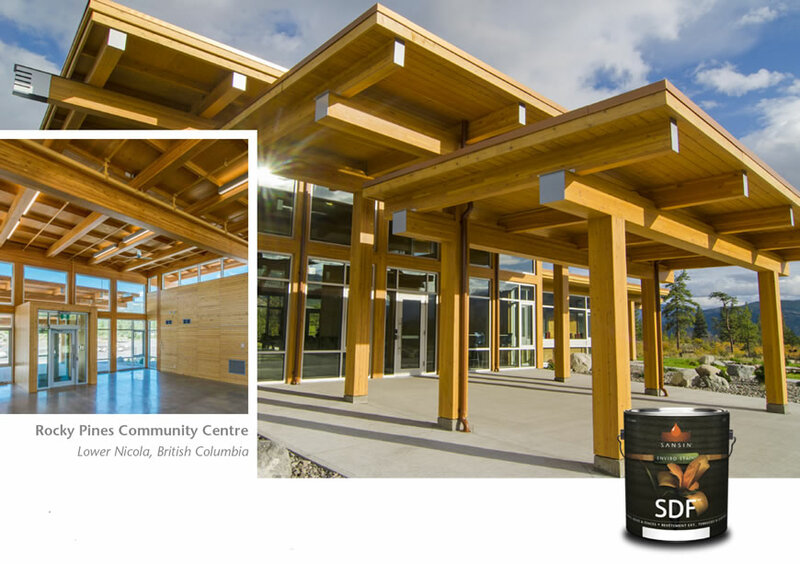 The Rocky Pines Community Centre, located in British Columbia and designed by Lubor Trubka Associates Architects, serves as a large, multi-functional community space on Lower Nicola Indian Band land. The building architecture features a post and beam structure that uses mass timber elements such as glue laminated beams and timber, along with interior wood featuring select tight knot Ponderosa Pine. Sansin’s architectural wood finishes were used for their beauty, protection and low-VOC profile. The posts and beams are coated with KP-12UVW and Sansin SDF in a custom Light Honey. The pine interior boards and trim feature KP-12UVW and ENS Optimum Clear. Penetrating one-coat finish for exterior wood. Exceptionally versatile protection for siding, logs, decks and fences. Beautiful, durable, highly water-repellent, breathable and UV-resistant. A clear top-coat for maximum performance.